Motherhood, Christmas and The Doctor, The Widow and The Wardrobe (2011). | Randomwhoness: a Doctor Who blog by Johnny Spandrell. Sampling stories in random order. Motherhood, Christmas and The Doctor, The Widow and The Wardrobe (2011). I replied that for me, that season just past in fact seemed all about fatherhood, which was a theme in The Curse of the Black Spot, The Rebel Flesh/The Almost People, A Good Man Goes to War, Night Terrors and Closing Time. And of course the following year, we meet Rory’s father as well. But my friend in her righteous indignation and me in my well, dullness, had missed a rather obvious point. TDTWATW, as it now must be known in order to save me from RSI, is Doctor Who‘s seventh Christmas special (eighth if you count The Feast of Steven). By now, we’re used to the trappings of Christmas being repurposed for the series’ own peculiar purposes. But it’s fun to have a look at how they work here. Whereas other Christmas episodes take hitherto festive elements and make them deadly (Santas, snowmen, angels and so forth), here writer Steven Moffat uses Christmas trimmings as plot devices: a boxed gift is this story’s magic doorway to a planet where trees sprout their own decorations, topped by naturally occurring stars. Like the three wise men, Reg follows a bright light in the sky to his destination. And the family Christmas dinner is central, with the Doctor even being guilted into attending Christmas dinner with his in-laws. The previous year had been a Dickenisan Christmas; this year it’s C S Lewis’s turn. In his Chronicles of Narnia, a wardrobe in a house leads to a snow covered world, as four young evacuees from London discover. In TDTWATW, it’s the present that leads to a snow covered world, and Peter, Susan, Edmund and Lucy and condensed into Cyril and Lily. There’s no white witch or talking lion, but the wooden king and queen remind us that the original four kids all became Narnian royalty in the end. But aside from Christmas and Narnia, there are other more secular themes woven through the story. It’s a familiar trick of modern story telling to pepper such themes through a story, so that a pleasing symmetry of ideas emerges by the story’s end. TDTWATW is useful in this case, because these themes are more pronounced than usual for Doctor Who. For example, there’s following. Cyril follows the Wooden King through the forest (let’s not stop too long to ask why he does that), and later we learn that when Reg was courting our stand in companion Madge (sparky Claire Skinner), he would follow her home from work (bit creepy, but there you go). 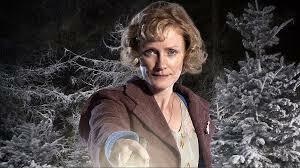 At the story’s climax, Reg follows Madge’s light back home. Ah, and we have symmetry. We can trace the same thematic path through the story with ideas such as evacuation, happy crying and wishmaking. So all in all, it’s a shame Reg has to live. That might sound a bit cruel. And yup, it is and that’s the point. Having Reg turn up at the end of the story works against the story’s theme, that you’ll only be at peace if you can admit to yourself the hurtful truth. But when he’s suddenly alive again, there’s no hurtful truth to face up to. It’s the falsely cheerful note at the end of a sorrowful lament. But hey – this is for broadcast on Christmas night, to millions of families so sentiment has its place. But while Reg’s resurrection feels out of place with this story’s themes, it’s absolutely in step with one of the Moffat era’s recurring favourites which is that death can be cheated, or in more prosaic terms, “if you can remember someone, they can come back”. I’ve never been comfortable with this one, and am sure I’ll be writing more about it, so I won’t labour the point here, except to say that I think it sends a dangerous message to younger viewers that death is temporary. I wonder how those facing the very permanent death of loved ones in real life feel about that. So TDTWATW is a story that shows its workings; we can see the themes layered through it and we (particularly those interested in scriptwriting) can see when and where Moffat uses each theme to create an overall effect. And it’s also a story where everyone feels like a stand in for someone else: Madge is our temporary companion, taking the place of the Ponds. Cyril and Lily are substitutes for the Narnia kids. The three Androzani harvest rangers, Droxil, Billis and Venn-Garr are jokey alter egos of the show’s three exec producers, Moffat, Beth Willis and Piers Wenger. And Reg, stuck up there in his WW2 plane is played by Alexander Armstrong, who played a similar WW2 pilot in The Armstrong and Miller Show. Even the Doctor is standing in for the house’s absent Caretaker. (But again, don’t stop too long to ask why he doesn’t just reveal himself as Madge’s fallen starman right from the get go). Everyone is a representation of someone else. And so this is Christmas, 2011 style. And it is Madge’s story – a mother’s story – and motherhood is central to it. And this is the obvious point I missed on broadcast: Christmas is a story about birth and motherhood, and that’s why Moffat is using it here. Whether he has a ’motherhood obsession’, I couldn’t say. (Actually, I can and I think the answer is no. He’s actually more preoccupied with children and their place in Doctor Who and that naturally leads to stories about parenthood. But that’s for another blog). It’s no coincidence that when Madge becomes the “mother ship”, the carrier for life in the form of the souls of trees, she does so without going anywhere near her husband. As crass as it sounds, Moffat has added the immaculate conception to the list of festive tropes Doctor Who wheels out at Christmas. If nothing else, that’s… audacious. LINKS to Battlefield: Both take their starting point from classic English stories; the Arthurian legends and the works of C S Lewis. NEXT TIME: Tonight is not my bath night. It’s our first Troughton and our first missing story, The Highlanders. Previous PostMotivation, magic and Battlefield (1989)Next PostCompanions, growing pains and The Highlanders (1966/7).